How was your weekend? Mine was just….I have no words! 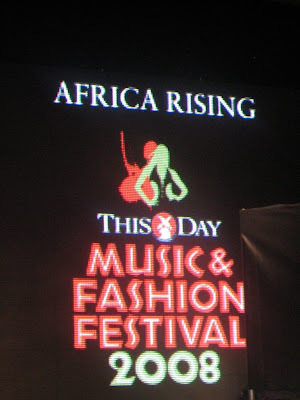 Anyway, I attended the 3rd edition of the ThisDay Music Festival last night/this morning. 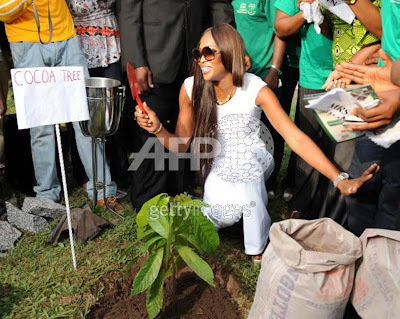 The ‘Africa Rising’ Event actually kicked off in Abuja last week when Naomi Campbell and some other celebrities planted tree in Nigeria’s Capital - Abuja. 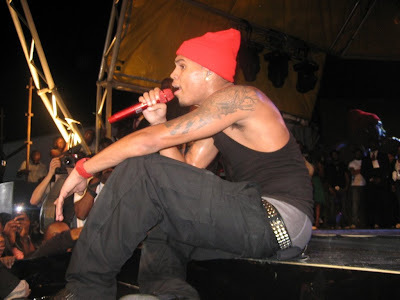 On Friday, 11th July 2008, the musical concert in Abuja took place with performances from Jay-Z, Usher, Rihanna along with local artistes including up and coming rapper, MI. I didn’t attend the Abuja show but here are some tidbits and pics. I heard the music show went well although it started really late as well. Usher did an amazing job, the ladies were screaming. Jay-Z killed it as always. He and Rihanna performed 'Umbrella' together. They have done this only a very few times live in the past. All the guys were drooling over Rihanna, apparently she is the 'freshest' lady ever. Even one of my female friends who met her said her skin is like butter. WOW. Skin like butter + Chris Brown as a boyfriend....do we need more reasons to hate her? lol. Ozwald & Oluchi were there looking fab! So I couldn’t decide if I should go for the Lagos show or not cause I was sooo exhausted on Sunday but I dragged myself out of bed anyway. The venue was the Lagos Polo Club, ThisDay setup a dome for the event. People who paid 5,000/10,000naira were seated outside the dome with a large projector screen to watch. Inside the dome, VIP (50,000) were placed at the end of the runway while Golden Circle (60,000) were infront of the stage/around the runway. The sponsors - Diamond Bank, Access Bank & GTBank all had elavated hospitality suites so they had a good view as well. 'All Access' pass holders watched the show from the stage and backstage. It was mainly Nduka's kids and their friends, the ThisDay Staff, designers, models, photographers, crew etc...rather random bunch actually. Anyway, the show was supposed to start by 6PM and surprise, surprise….It started almost 4 hours late….about 3 hours and 40 minutes late to be exact. The crowd was a mix, many of the usual suspects that you see at every Lagos event but the crowd was dominated by teenagers!!!!! I guess with Chris Brown on the bill, that was to be expected. I have to admit that the new generation of Nigerians are incredibly stylish. These teenage girls and boys are not playin’, they express themselves very well with their style. Anyway, I picked my spot right by the stage and I had an amazing view of everything! The host of the show was veteran media personality, Olisa Adibua. 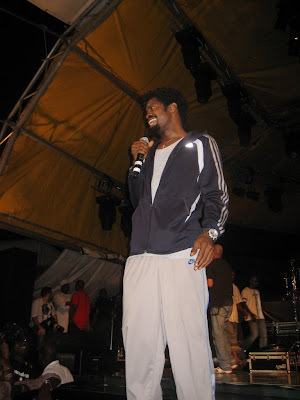 He gave a brief introduction to hype up the crowd then comedian Basketmouth joined him on stage to ‘crack’ a few jokes. Soon after, Mary J Blige, the Queen of RnB arrived on stage. She was rockin a denim jumpsuit with grey boots and her signature blonde weave. My first observation was that Mary is fit! She has an amazing body and obviously works out. I also spotted her husband Kendu chillin at the side of the stage. She started off with her old hits from the ‘What’s the 411’ album and took things from there! I have to admit Mary is an AMAZING performer! Energetic, passionate, fun, vocally on point! I was thoroughly impressed. For all the women in the audience, she had so many positive messages about loving yourself, being confident and all that. I felt her! By the time she began crooning her more recent hits including ‘No More Drama’ and my personal fav ‘Be Without U’, the crowd was eating out of the palm of her hand. Singing along, dancing, clapping! It was a great atmosphere. She closed off her set with her most recent hit ‘Just Fine’. 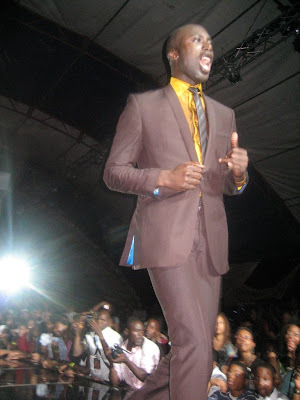 After Mary’s performance, Basketmouth and Olisa come back on stage. Basketmouth cracked the crowd up with his jokes. He was laid back and funny! While he was performing, the stage was being worked on for the next act so it was kinda distracting. Basket was on stage for a while….he decided to invite some entertainers in the crowd to join him. 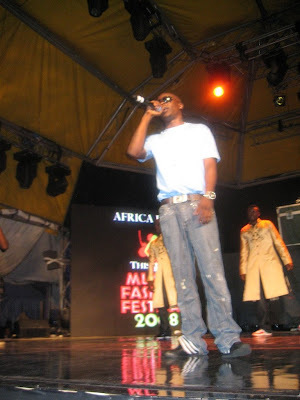 Ikechukwu did a freestyle version of his hit ‘Wind Am Well’. 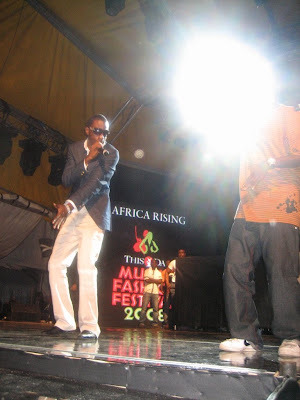 Wande Coal and D’Banj also cruised the stage for a lil’ while and dropped a few snippets. Don Jazzy, 2Face Idibia and Austin 'Jay Jay' Okocha were at the event. Next up was Chris Brown and to say the crowd went crazy would be a serious understatement. They were DELIRIOUS! But what’s to be expected with over a thousand teenage girls. 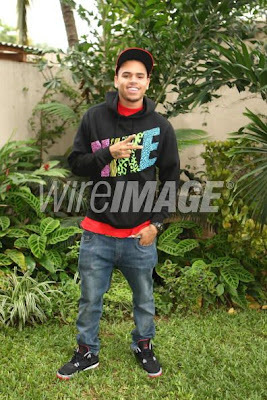 I have to admit that Chris is fine! Yes, I am like 5 years older than him but seeing him do his thing on stage was impressive. He killed it! He started with his hit ‘Wall to Wall’ and just took things from there. He, his dancers and his fine DJ…..worked perfectly together. The dance moves were well synchronised, the banter between him and the DJ was slick. When Chris took off his shirt, the crowd went crazy again! Overall, it was just an amazing performance! Even the oldies in the crowd were thoroughly impressed especially when he performed his ballads ‘No Air’ and ‘With You’. At the end of his performance, one of his crew threw his beanie hat into the crowd…it landed in my hands....then ricocheted to the 2 teen girls next to me. They then proceeded to wrangle over it for some minutes. The strongest won LOL. After Chris, there was nothing for about an hour. The crew was setting up the stage….Logistics! Forever the bane of Nigerian events. I wonder when it will change. 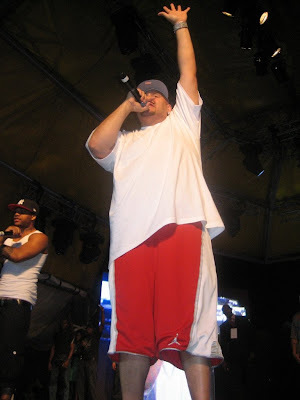 Up next, Joey Crack…Fat Joe. Dude might be fat but it didn’t affect his energy levels. I looked into his eyes and he had a steely stare. He was in the ZONE. He and his crew kept the crowd entertained with hits including ‘New York’ and ‘Lean Back’ when he performed ‘Make It Rain’ some decided to spray some naira notes…There was also a fashion show featuring designs from New York based Lola Faturoti during the performance. 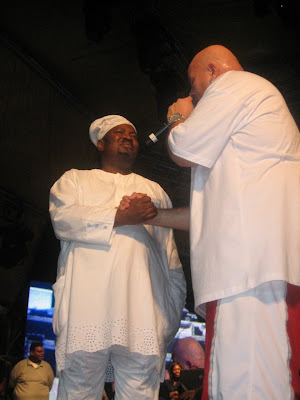 Throughout his performance, Fat Joe kept on saying how it was so great that ‘Nduke’ invited him to Nigeria lol…he said it was many times and it was quite funny. 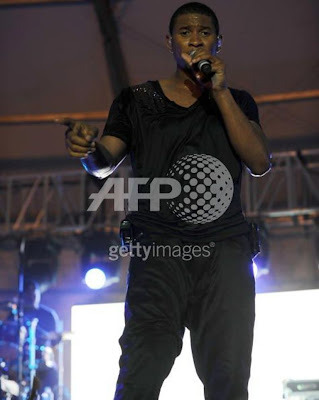 the crowd had to correct him as per its ‘Nduka’. He invited ‘Nduke’ on stage to say Happy Birthday as today is Mr Obiagena’s birthday. Overall, strong showing by Mr. Crack! He was sweating buckets though. Another almost hour long interlude to reset the stage. BAD! Then the fashion started, Chris Aire, the famous bling designer or should I say ‘innovator/designer/gemologist’ as he was described in his introduction video. His show featured bling. Lots of it. The models were all dressed in white and embellished with diamonds. 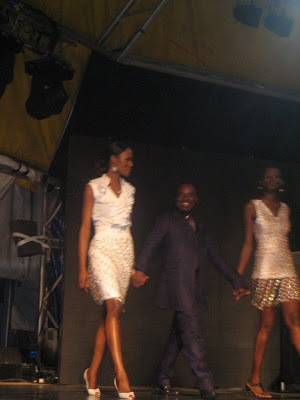 Oluchi, Ojy and other models featured in the show. Logistics/setup break – Almost hour long. BAD! Next up, Ozwald Boateng. I love Mr. Boateng! He is talented and just sooo fine. Clothes were on point as always. Cut to perfection. Fabric was lush. Colours were awe inspiring. Mr. B strutted the stage at the end of his show. U can tell he is a fun loving dude. Loved it. He is sooo HOT! Need I say it again. Another long break to set up! Bad, Bad, Bad! 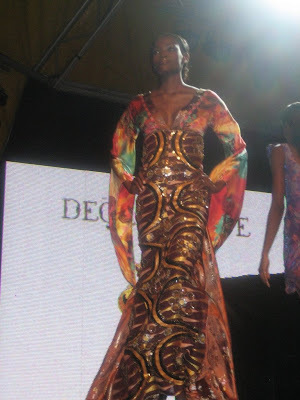 My fave Nigerian designer, Deola Sagoe showed her new collection. The rest of the clothes were beautiful. 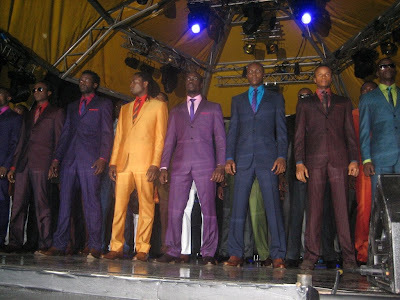 The models did their thing and showed it off well. Break again to setup the stage. The crowd thinned out at this point. Mr ‘Julie’, Shank performed. Was cool. The crowd were hyped. His dancers were something else. Very energetic though. Liked it. To close things off, rave of the moment. 9ice. He stepped on stage looking suave in an Okunoren Twins ensemble. The crowd just loved him! Even the security guards who were stoic all night had to sing ‘Street Credibility’ along with him. He also hit us with ‘Gongo Aso’. 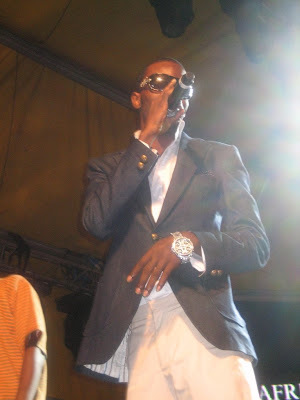 9ice closed the show off with a bang! To be honest, I had fun but the late start and all the lapses in logistics really tested my patience. On the bright side, Mary J, Chris Brown and Fat Joe held my hand LOL. For the numerous people who got free passes – Press and All Access Passes. I think the festival was fabulous for them. For those who paid 5000/10000 naira for regular tickets but then wrangled their way to the front. Great for them but for those who paid 50000 and 60000 for VIP & Golden Circle tickets…..It must have been a little upsetting. In all, kudos to Nduka. You could see him working and sweating along with everyone trying to ensure that the event was a success. I see and feel his vision of trying to change the perception of Africa from a poor beggar to a fun loving prosperous continent that is inviting to perspective investors. That said, these ‘Africa Rising’ shows probably cost well over a billion naira in total to fund. I can’t help but think that perhaps there is a different way that such funds can benefit Nigeria and Africa. After all is said and done, I totally respect the effort. Many sit and criticize but he is taking action. Stunning outfits! Wish I could have been there. It sounds like it was a really nice event from what you have described, apart from the very late start and the time wasted on setting up in between. These events are high-profile so they should be better organised. 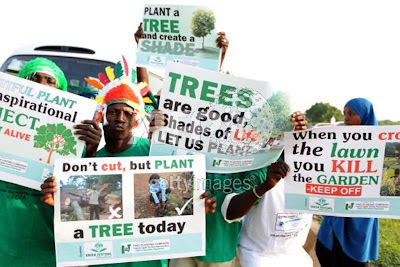 I'm glad Nduka and the other organisers are trying to do something positive though. Nice photos and outfits. Thanks for the info Bella. 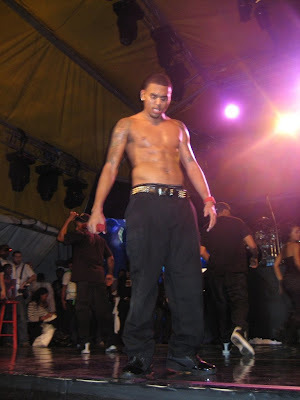 Chris brown is d bizness and his body is baaaaanging! .....and i'm old enuf to be his aunt (cant say i blame those teenage gals)..lol! BEllaaa I knew it was you I saw!!!! UR pretty!! OMG lol Did those girls push u when they were fighting for the cap and the towel?? Pele oh I left early couldnt wait after Chris brown !! lol Yes paid 60K it was good I was a little annoyed that we hd to "Hustle" for seats!! Asin see fight but trust I got a seat in front so that I cud see my CHrizzy. Can u imagine them testing us with songs?? 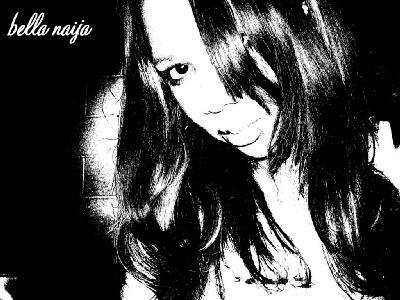 A milli, The Boss etcc Them no KNow Nija ppl!! Anyways was a gud night hope u had fun cos I did. U didnt mention the banks and their own vip sections with food and evry thing. 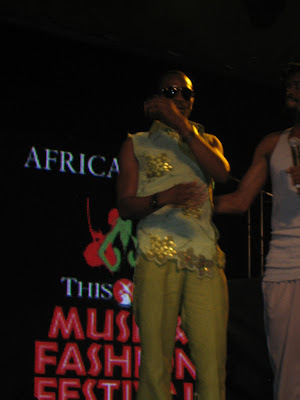 I wasnt happy about that either..and I saw Mr Nduka's Daugthers on the stage when Chris was performing. They didnt look fazed or interested at all which was weird. Oh well maye they were tryna act like he was nuthin?? Who knws!! Anyways good one bella! 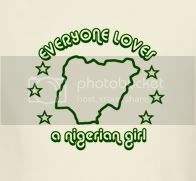 its a lie.....somebody spotted BeLLa NaiJa? I really hope she reveals her identity soon. We love u Bella...oH...or should I speak for myself...I love u!...sisterly love tho! Good job Bella. I am impressed. I am all the way in yankee but you narrated the story so well and made me feel like i was at athe show.Kudos to ya. MJB is my girl any day. You can't go wrong with her. Chris bizzy is an outstanding performer. Naija needs to step up their game and work on logistics...the one hour interval to set up a stage and what not is a turnoff. Time is money. No one wants to be at a concert for these lapses, what with the hot weather and all. All in all, it looked like an amazing show but for the lapses. 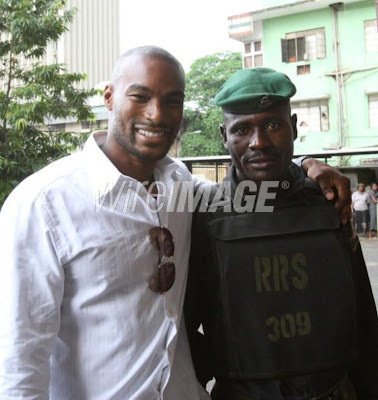 Enhen Bella I forgot to ask.. was Tyson Beckford ther???? By the way Chris was like one fine Ibo boy!! @miss moss, Bella is a senoir chick and a big babe oh. Her portfolio ranges from lawyer, accountant, designer, u name it...lol. I gotta give it to her. She is a high flyer & she deserves it. well done... you covered the event well enough for me to visualize how it went down... and pictures helped too..Great Job Bella; as usual! @ a girl....really? lol...what were u wearin...i'm sure i saw u too! This is the first time since this series started that i did not attend..Nor did i want to...Would have loved to see mary J Blige though..Glad you had fun...How have you been bella>? Excellent coverage - looked like one hell of a show. Olisa - veteran, you hear the word, and the first thing that clicks is old - cousin is only 42/3. But then it could mean a long experienced fella, which he is. Well done as usual. Sadly Im so swamped with work that it vaguely blipped on my radar. Or Im getting way to old. I need my life back! As usual great reporting from you, well done! it must have been crazy seeing chris brown..I am at least 10 yrs older than him..but totally in love!! lol .I heard the concert in Abuja was great from my friends ..rihanna and jay z especially drove the crowd crazy..also heard that rihanna almost didnt perform cus she had signed in her contract that if she didint sing by 10.30 then she would love..n urs truly kn ows the show didnt strat til like midnight.. it was so disorganised..Nduka good job but try n get a tighter show next time.."I can’t help but think that perhaps there is a different way that such funds can benefit Nigeria and Africa" of course there is? I know nduka is doing his bit, but dont understand how these shows he holds benefit the common man. interesting Bella, with your account i was there!lol. yeah it beats me why there seems to always be a nigerain factor of timing and some sort of disorganization. A whole lot of us are guilty. Maybe from the nursery school there should be a curriculum that teaches time mangt.I will be the first to sign in as a pupil. Kudos to Nduka but let us learn these truths cos they are subtle ways of saying who we really are. Wow, detailed! lol, I felt like I was there. The last show was the same, full of stylish teenagers, some attempting to be rude...I guess I look like one of them LAWL. All I can say to that tyson pic is SHEEEEEEEEEEEEEEEETTTTTT lol! I want to help coordinate the next festival... these time issues need to be resolved ASAP.... Jeez... didnt coordinators take classes in Time management and productivity..
Love the feedback really detailed!.. I just left Abuja about 2weeks ago why do i always miss the good stuff!! i am sure it was hot!!.. 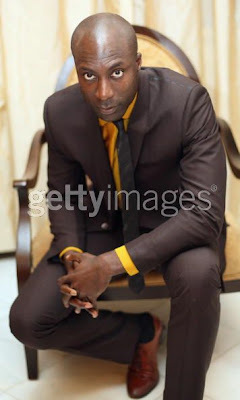 I love 9ICE i mean i am one of his biggest fans but really he does look so uncomfrtable and stiff in that fabby suit money no de fit everybody oh! 'Standard' This Day planning or lack there of. Having been on the planning/ logistic side of things in the past, I had no interest in involving myself with the mess again. Don't get me wrong, Nduka is doing a fantastic job and his vision is great. But let's crawl before we attempt to stand up and run! 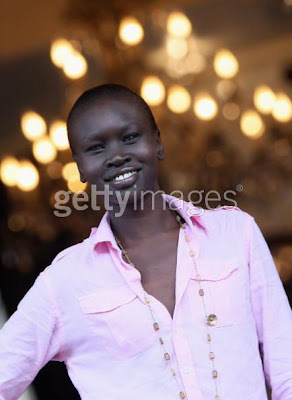 And I was wondering why Naomi, Alek and Tyson were not in any of the runway/fashion show photos on Getty/Wireimage. There were only daytimeones of them. After looking at Oluchi I have decided to not eat the Hagen Daz tonight. I am shocked that Usher returned to Naija. I read that the first time he came he was crying because people were grabbing at him. Oy Bella....i must have seen you at some point and not recognized u! The place was just thick and there was serious fighting before you could even get a place to stand! three of us ended up sharing one white picnic chair. All kinds of people were poking by back my neck...and then the rude security guards who decided to shove all the 60K paying guests. Too mad. I wish I had seen u tho! Mary J. is phenomenal. Absolutely phenomenal. Chris Brown is okay (especially his bod!) but dude has acne meeeehn! Oluchi looked really great and Oswald as usual fantastic. I am 44th yay...get over this first thing already..
Nduka won't keep doing these shows if he and his investors weren't making money. Don't get it twisted! But I agree who ever said having a concert with international superstars in Africa is a sign of progress. To the layman yes it is, but those who know know that don't mean shyt. great reporting hon,made me feel i had witnessed it all.I'm told from those who have seen Mary J Blige live that she is always on point. 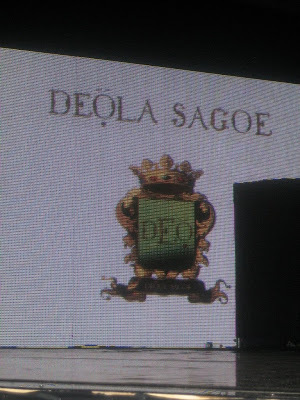 It is amazing that an event in Africa is able to pull such great names under one roof.Wish i had been there! ;-)Great post Bella. so see why i have mixed feelings about it? Bella I have to say I really enjoyed this article... wish I was there. You are really good at what you do and it's very impressive and inspiring. Good Job!!! I completely agree with you on the Money spent in organising the show. Do you know how many families could have benefitted from that kind of money if it was invested on a project that helps them achieve something in life. As far as it's fun to see-It is misplaced priority as far as i am concerned. What exactly are we trying to tell the world ,no matter how we try to come accross as improving.The fact still remains 99 percent of Nigerians are poor and suffering real hard. So i am sorry to say this.That didn't impress me at all. Lovely article, brilliant pics... but I have to ask, where was Durella... the boy is just too gbaski. EEnh Bella I never got back to you!lol Werent u wearing a dress?? I was wearing one top and jeans and was behind thee girl basketmouth was like she is fine...I was the one that screamed she was 12 lol she actually wasnt sha I just wanted to see what he would do lol anyways gud fun memories etc. Do not use any photos or content from www.bellanaija.blogspot.com without permission and/or a link back to the site.